This is a great photo in so many ways. 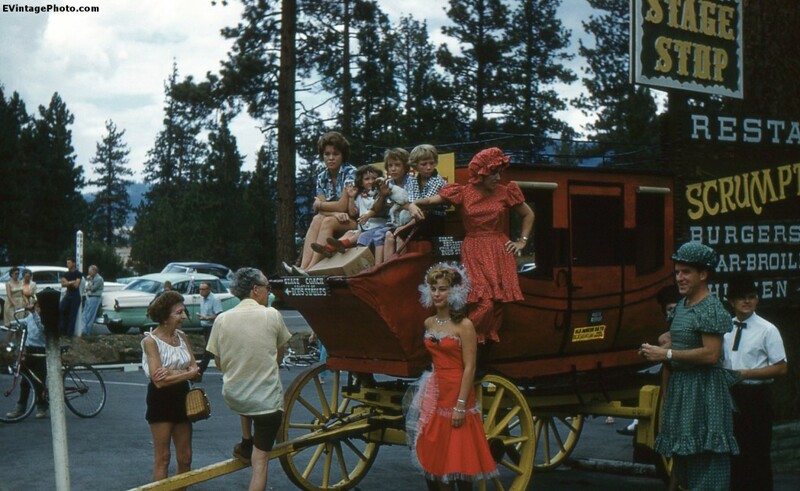 We have a Stage Coach in 1961 provided by “Bob’s Stables,” and a couple of people dressed up in “Western wear” of some sort. Including one older gentleman dressed in the more feminine costume. Kids are climbing around on it to get their picture taken, while a lot of adults are just hanging around in the background. From what I can tell based on the signs in the pictures it’s either “Stage Restaurant” or “Stage Stop Restaurant.” Google reveals a good dozen hits for each of these, so I’m not sure where this was actually taken. Other pictures in the same set are not useful as most of them are of Europe, while this is obviously an American roadside attraction of some sort. Most likely the place is out of business anyways. In the 1960’s men dressed as women. And rode a Stage Coach! Does anyone have any guesses on where this might be?